The latest catastrophe to hit the Damascus-area Yarmouk camp is an ongoing outbreak of typhoid. Besieged by the government for years and invaded by ISIS in April, Yarmouk’s Palestinian refugees struggle for a way out. Just like Syrian civilians across the country, Palestinian refugees have been caught in the crossfire as the civil war rages on between President Bashar al-Assad’s government forces and rebel groups. In Syria’s largest Palestinian refugee camp, Yarmouk, hardships have been multiplied by a recent outbreak of typhoid that has affected dozens of refugees who have been displaced to the nearby Yalda area, situated on the outskirts of southern Damascus. “As high summer temperatures and regular interruptions in water and food supplies continue to affect Yarmouk, Yalda, Babila and Beit Saham, communicable illness remains a source of profound vulnerability for civilians,” UNRWA, the U.N. agency for Palestinian refugees, said in a statement released Wednesday. Two weeks ago, the U.N. agency was able to gain access to Yalda for the first time since early June – it has not been able to access Yarmouk camp itself since March 28, shortly before the Islamic State (ISIS) launched an offensive that resulted in its fighters occupying more than 90 percent of the camp. Many ISIS fighters subsequently withdrew from the camp, but, along with the al-Qaida-linked Jabhat al-Nusra, the militant group maintains a heavy presence in Yarmouk. Local refugees had already been suffering from a government-imposed siege that began in December 2012 and limited the access of food, medicine and humanitarian supplies. 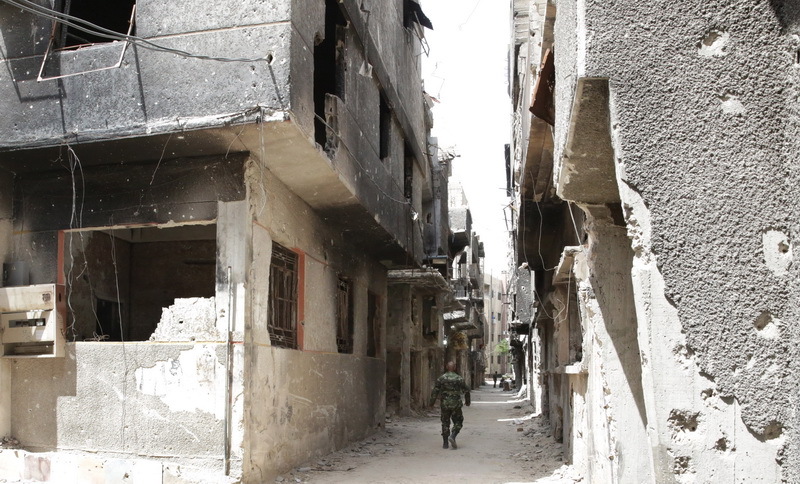 One of thirteen Palestinian refugee camps in Syria, Yarmouk was once home to nearly 200,000 people. As a result of the siege, the population dropped down to around 18,000, according to UNRWA. Following the ISIS takeover, however, just 5,000 – 8,000 refugees remain in the camp. UNRWA spokesperson Chris Gunness has described Yarmouk as a “hellhole,” but the U.N. dropped its classification of Yarmouk as besieged in July. Rejecting that move, remaining residents tell Syria Deeply that has only gotten worse. To make matters worse, ISIS and Jabhat al-Nusra have launched a campaign of assassinations that has killed more than 30 Palestinian political leaders, activists and community figures since mid-April, the Yarmouk-based Jafra Foundation for Relief and Youth Development told Syria Deeply last month. Among the more than 240,000 people killed throughout Syria’s civil war are at least 3,001 Palestinians, according to the U.K.-based Action Group for Palestinians in Syria. Another 966 are imprisoned, while at least 277 have been abducted and cannot be accounted for. 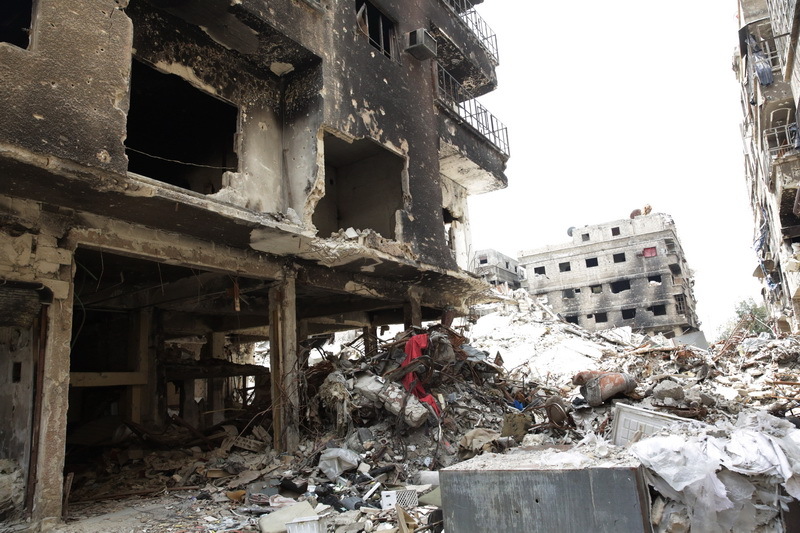 It’s not just Yarmouk that has been targeted by the government and opposition groups, either. Since first being bombed in August 2012 by government forces, the Daraa refugee camp has been about 60 percent destroyed, estimates Wesam Sabaaneh, youth director for the Jafra Foundation. The Damascus area camps of Husseiniya and Sbeineh have been evacuated of all their residents, as well. “The main concern we have is that Palestinian camps are more vulnerable than many places in Syria because the Palestinians there are already refugees,” Sabaaneh told Syria Deeply. At least 30,000 Palestinians are among the 250,000 people currently besieged by government forces for more than 45 days in Qudsaya, a town near Damascus. Meanwhile, back in Yarmouk, local medical workers and humanitarian volunteers are unable to cope with the illnesses and starvation gripping the camp. At least 45,000 Palestinian refugees from Syria have sought refuge in neighboring Lebanon. Around 95 percent of those who stayed behind – around 480,000 people – are dependent on U.N. aid in order for survival. Michael Rawlins is an Assistant Professor of Geosciences at the University of Massachusetts Amherst.